Redbuds are small trees or shrubs that may attain heights of 10 m or so. Leaves are alternate and two-ranked, simple, entire, deciduous, broadly cordate, with an acute apex, 6-11 cm long, 7-12 cm wide, and palmately veined. 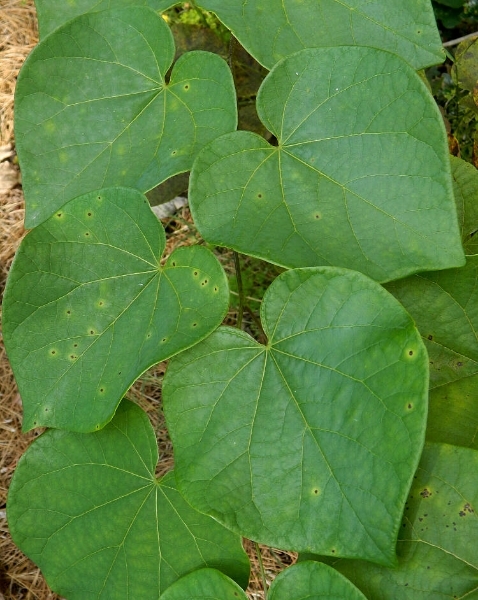 Petioles have two swollen pulvini, one at its connection with the stem, the other at its junction with the leaf blade. Flowers first appear in the spring before leaves emerge, although early stages of leaf development may overlap with the last flowers to open. 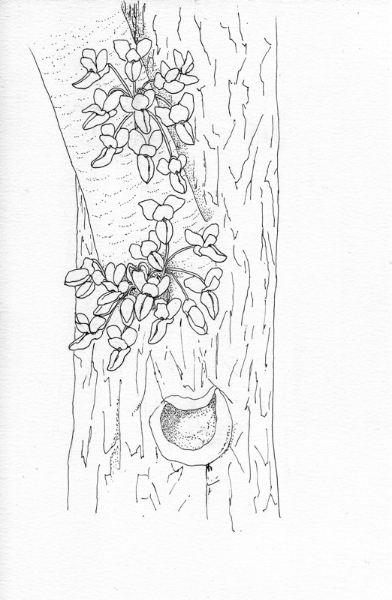 Flowers are produced in nodal clusters that may arise on any part of the tree, from the youngest twigs of the previous year to the main trunk (a habit known as cauliflory). Pedicels are slightly longer than the 1 cm long bilaterally symmetric flowers that are oriented more or less horizontally. The base of the flower consists of a nectar-bearing hypanthium continuous with a tube-like calyx, the lower portion of which flares sharply downward, resulting in a complexly contorted floral tube below the petals. Whereas the 5 sepals, 5petals, and 10 stamens attach to the rim of the hypanthium, the single pistil arises from its base. The two lowermost “keel” petals project forward and enclose the 10 separate stamens and single pistil; the other three petals diverge upward from the calyx tube—these include a short “standard” petal occupying the flower midline, flanked closely by two longer “wing” petals; the uppermost or standard petal is innermost in the bud. From tree to tree, flower color ranges most commonly from rosy purple to pink and rarely to white; within a single flower darker hues predominate on the hypanthium and calyx, contrasting with the somewhat paler petals; sometimes keel petals are darker than wings and standard. 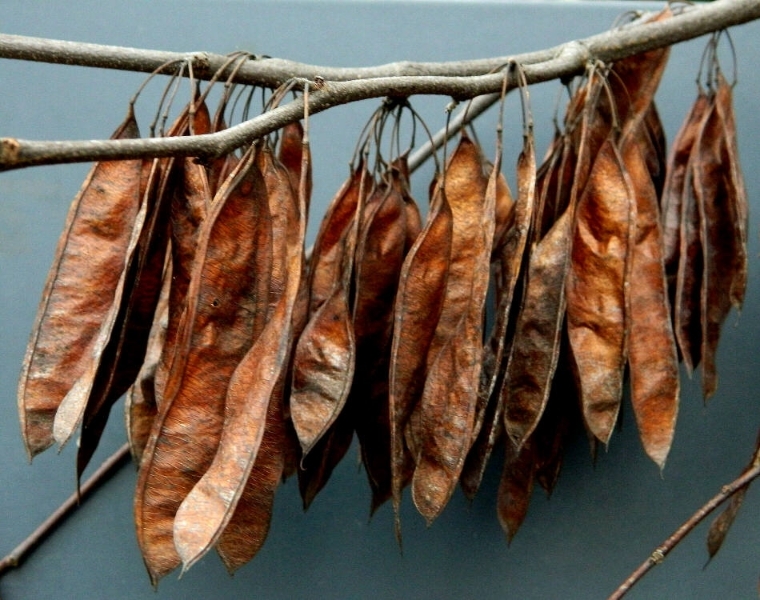 The indehiscent fruits resemble flattened tan–brown pea pods 4—10 cm long containing several smooth, hard seeds. 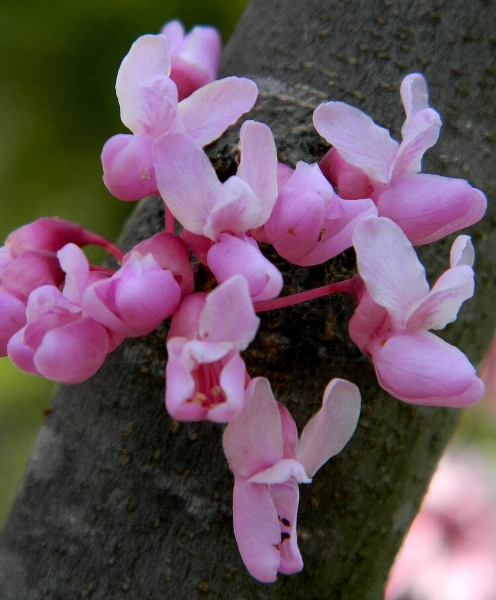 common name “redbud” refers to flower color. Another common name, “Judas tree” derives from the legend that Judas Iscariot hanged himself from a Mediterranean redbud tree; alternatively, “Judas tree” may be a corruption of the geography-based name, Judea’s tree. Cercisis a legume, classified in family Fabaceae, subfamily Caesalpinioideae. The genus consists of eight to twelve species found in the north-temperate zone. 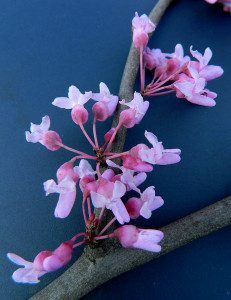 Virginia plants are classified asCercis canadensis variety canadensis, to distinguish it from slightly different varieties found to the south and west. 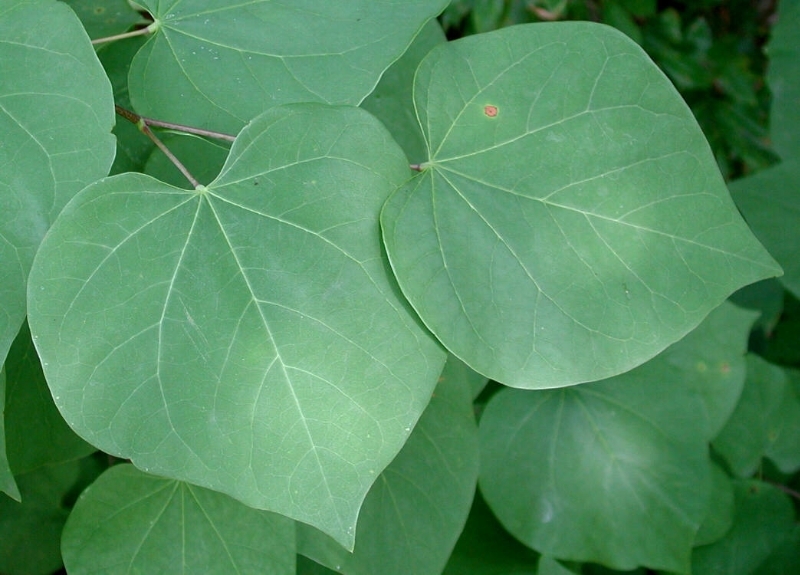 Several Native American tribes used leaves, bark, or roots of redbud to treat a variety of medical problems ranging from congestion to fevers and vomiting. Fresh flowers and fruits—as long as they are young and succulent—are edible; reportedly the flowers are simultaneously sweet and tart. 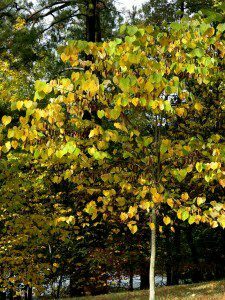 The trees are much prized as ornamental landscape plants, valued for their appealing small to medium stature and striking early season blossoms. Cercis canadensis is found in woodlands and forested roadsides, but it will also colonize old fields and other treeless areas. It prefers dry to mesic calcareous soils and generally avoids wetland habitats. Ground-feeding birds such as bobwhite quail eat the seeds, and deer (as well as livestock) browse the foliage. Honeybees visit the flowers; native pollinators include long-tongued bees like bumblebees and carpenter bees. groups, or as scattered understory trees in a woodland garden. The trees are spectacular in bloom, and named selections offer a varied palate of colors from red/purple to white. Cultivar ‘Forest Pansy’ is noteworthy for its purple/red foliage. Fall color is yellow, against which the dark seed pods are particularly striking. 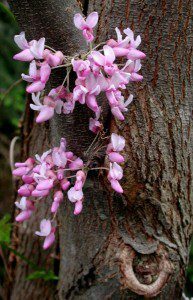 Redbuds are most easily propagated by seed, but scarification and cold stratification are required; if pampered, seedlings can reach flowering size in a few years. Cuttings and bud grafts have high failure rates. Redbuds occur from southern New England west to Nebraska and south mid-Florida, Texas and northern Mexico; populations in Texas and Mexico are often recognized as var. texensis and var. mexicana, respectively. 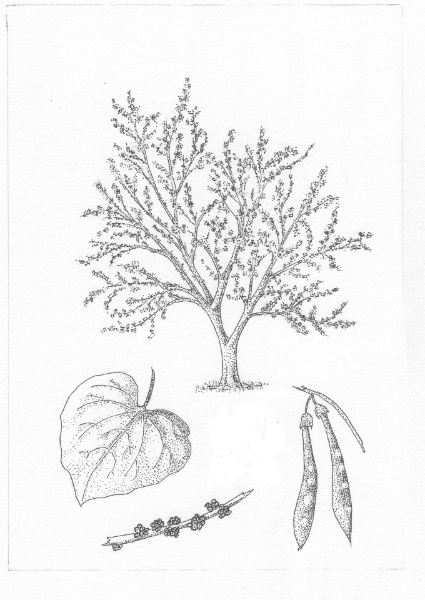 A related species, Cercis occidentalis can be found in Arizona, California, Nevada, and Utah. Redbuds have been documented in nearly every county of Virginia. 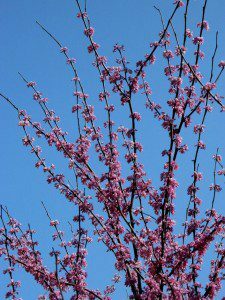 Redbuds are common and abundant throughout much of Virginia; their conservation status appears secure, generally. To see and learn more about interesting species of plants native to Virginia, visit our Website (http://www.vnps.org) and contact your local chapter of VNPS (details on Website) for the times and dates of programs and wildflower walks in your area. Text and photos by W. John Hayden; drawings, Nicky Staunton. Web format by Sue Dingwell.